Lie on the full-length BioMat Professional and you will instantly feel the warmth of the infrared rays deeply penetrating your body as the negative ions deliver healing signals to your body. 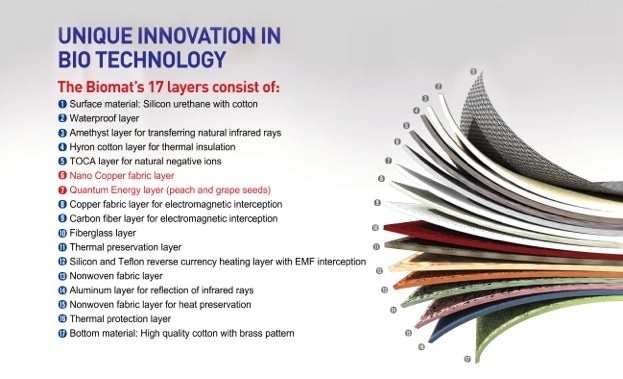 Because the BioMat’s unique technology penetrates at the cellular level, it is capable of addressing a wide range of health issues. When you purchase a Professional BioMat 7000 MX, is a medical device that uses only top-of-the-line components, including a computer control panel with, an advanced IC chip manufactured by Texas Instruments, a polarized plug for power source protection, EMF interception tourmaline catchpower for a negative ion boost, and pure, superconducting amethyst channels covering the entire surface area. These channels are laid over a multilayer, bonded base comprising 17 unique materials. In addition, the BioMat comes with the uniquely designed washable cotton pad for a gentler and more comfortable far infrared treatment. The BioMat has undergone rigorous third-party testing, including FDA registration and ISO certification. The efficacy of the device’s far infrared rays has been confirmed by the Korea Institute of Far Infrared Applied Estimation. These include all of the basic package offerings, plus the ability to portal message with your physician in between visits, IR sauna sessions, BioMat sessions, InBody advanced body composition analysis scans, and bigger discounts on package purchases. 3, 6, and 12-month memberships are available.